Watch the awesome video footage below of Tom Cruise doing his own stunts on the set of MISSION: IMPOSSIBLE GHOST PROTOCOL as he runs around the side of the tallest building in the world. Love him or hate him, this is freaking awesome! Brad Bird directs this chapter that stars Cruise, Ving Rhames, Jeremy Renner, Paula Patton, Josh Holloway, Simon Pegg, Tom Wilkinson and Michael Nyqvist. 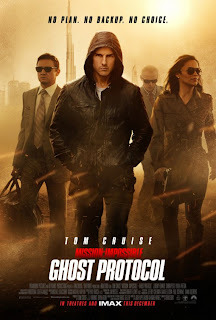 When a terrorist bombing destroys the Kremlin, the United States government initiates a black ops "ghost protocol" and disavows the entire Impossible Mission Force. Ethan Hunt and his team are to be blamed for the attack, but are allowed to escape as part of a plan to enable them to operate in the dark, outside of their agency. However, Hunt is warned that if any member of his team is captured during their mission, they will be charged as terrorists planning to incite global nuclear war. Ethan is then forced to work with ex-IMF agent Brandt, who knows more about Hunt and his past than even Hunt himself. Mission: Impossible Ghost Protocol hits theaters on December 21st.